See how much you can save with solar, get your free quote today! Last year we had solar panels installed on our house by Rooftop Solar and couldn't be happier. I received quotes from other companies and Rooftop was not only a better deal, but it was clear to me that I was supporting a local business that gives back to our community... You will have a lifetime of savings and ethical piece of mind to make it all worth it - many times over. Rooftop Solar did a great job. They are professional, courteous, timely, and fun to be around. Today, we’re setting a new electricity production record as I type. SWEET!!! 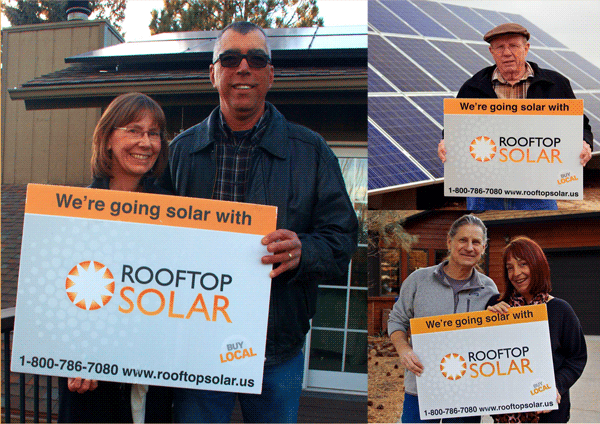 Rooftop Solar is the best. All of their work during the installation was done perfectly, and quickly too. I highly recommend them for their professionalism, depth of knowledge, and overall willingness to make solar happen at the lowest possible cost.